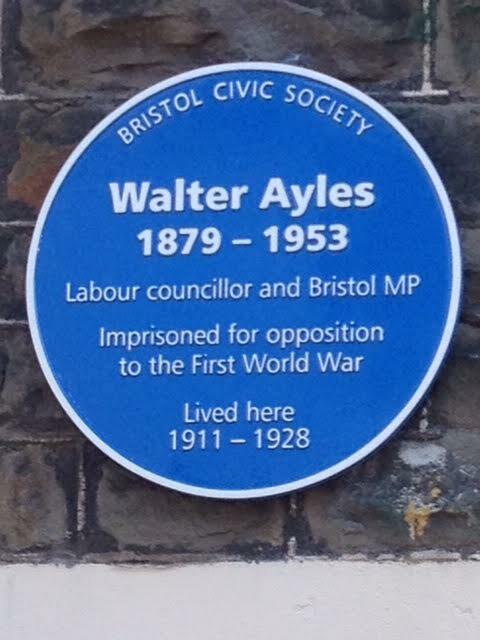 A BLUE plaque has been unveiled on a house in Station Road, Bishopston where Labour councillor and Bristol MP Walter Ayles lived from 1911-1928. The event took place on April 17, the hundredth anniversary of the arrest of Walter Ayles for distribution of a pamphlet, ‘Repeal The Act’, which argued against conscription introduced by the Military Service Act. He was arrested for two years for his opposition against WW I. The plaque has been installed at house number 12, thanks to the Bristol Radical History Group and The Remembering The Real WWI group. They asked for approval of the plaque from Bristol Civic Society and put together funds from many different sources. Colin Thomas, contributor to the Bristol Radical History Group, wrote a biography of Walter Ayles, ‘Slaughter No Remedy’ and he talked about Walter’s life at the event. He said: “Walter came to Bristol in 1910 as a local organiser for the Independent Labour Party. He was campaigning against the privatisation of transport, gas and water and for women’s suffrage. “He was against the progression of what he thought would be a catastrophic war. Soon after his release from prison he was elected Labour MP for Bristol North. There was poetry, song and excerpts from Ayles’ statement to Bristol Magistrates in April 1916 performed by Adam Church. Although the plaque is connected with Walter, it should honour all those who bravely opposed the war. The Radical History Group put together a list of 350 conscientious objectors in Bristol. Nationally, Cyril Pearce gathered information about over 17,000 men. On June 26 at 2pm, there will be a reenactment of Ayles’ appearance before a Military Tribunal where he applied for Conscientious Objector status. It will take place exactly one hundred years after the hearing in the same venue, The Old Council House (now the Register Office), Corn Street, BS1 1JG. Biography of Walter Ayles, ”Slaughter No Remedy’is published by Bristol Radical History Group costs £2.50. It is available online at www.brh.org.uk or from Hydra Bookshop, 34 Old Market Street, Bristol, BS2 0EZ. For more information email rememberingrealww1@gmail.com .